The PCI/PCIe expansion kit gives you the option of expanding your I/O bus to an additional 2 PCI slots or 2 PCIe slots via the host PCIe card to a chassis enclosure with the included expansion board and DVI like cable and components. Provides the necessary components to expand your PCI bus capabilities. The PCIe to PCI x2 or PCIex2 Kit is a PCI/PCIe bus expansion kit with all the components needed to put into an empty chassis for purposes of PCI/PCIe system expansion. The kit expands your I/O to either two PCI or two PCIe slots depending on your application needs. 3ft. DVI like cable to connect from PCIe card in Host computer to the PCI port connection of the optional chassis (not included). An additional card bracket for PCIe card optional low profile assemble. Software driver and utility disc. 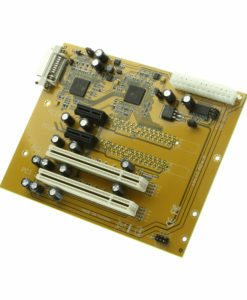 2 slot PCI/PCIe expansion board with integrated power and port connection. Chassis bracket for board assembly to chassis. The PCIe to PCI/PCIe expansion kit is designed to expand to incorporate an extra 2 PCI slots or 2 PCIe slots from your computers PCI Express slot. The PCI Express card can provide a scalable, high-speed serial I/O bus that maintains backward compatibility with PCI applications and drivers, this delivers a high-performance, point-to-point interface with 250Mbytes/sec to 4Gbytes/sec architecture. Taking advantage of this kit means assuring Plug-and-Play compatibility and no IRQ and I/O address conflict problems allowing you to expand your I/O resource to grow with your requirements. Note: A supporting chassis is not included as a part of this kit. Advanced PCI Bus Port Arbitration Options Include 128-phase, Weighted Round-Robin Time-Based and 128-phase, Weighted Round-Robin Aggressive Time-Based. Advanced PCI Isochronous Windows for Memory Space Mapping to a Specified Traffic Class. Host connector: One 24-pin connector for PCI Express Host Cable. ATX 2×12 Power Connector: One standard 2x 12 ATX Power Input Connect to be powered by standard ATX PC Power Supply.